If Home Alone were a horror film, with bloody deaths, real peril and Michael Ironside (!) instead of Daniel Stern and Joe Pesci, you’d have something like Knuckleball, a taut, Canadian, boy’s-p.o.v. thriller set on a snowy farm. Henry (Luca Villacis) is already an unhappy camper when we meet him in the family car en route to the farm owned by Jacob (Ironside), the creepy, taciturn grandpa he’s never met. His parents are due at a family funeral, and this is seen as on opportunity to drop their son off for a little bonding with a stranger (albeit one connected by blood) in an isolated location with neither wi-fi nor a phone. 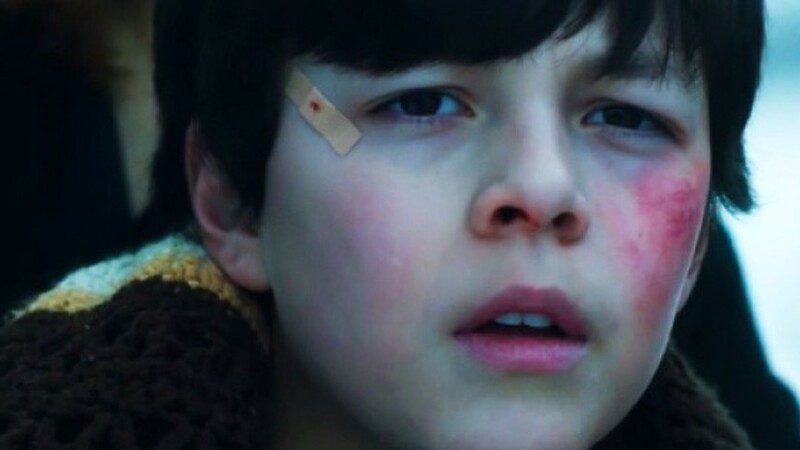 Luca Villacis is Henry, a boy in peril in his creepy grandfather’s farmhouse in Knuckleball. But Henry is an engaging kid, and he seems willing to please, even though his grand-dad’s idea of a good time is shoveling manure. All good, except for Dixon (Munro Chambers) that weird, overly-friendly guy in the farmhouse next door, who is shooed away by Jacob, and who watches balefully from afar as grandpa and grandson find a common bond in their love of baseball (the title refers to Jacob’s disgust when the strong-armed youngster asks him to teach him how to throw a knuckleball). Then something happens to Jacob, and Henry finds himself alone with the not-quite-right Dixon. Calgary director Michael Peterson hop-scotches genres nicely following his 2011 LARPing comedy Lloyd The Conqueror, constructing a set-piece as reminiscent of The Shining as of Macaulay Culkin tripping up bad guys with marbles. Once he realizes he’s the target of a predator, Henry responds with almost feral cleverness, creating traps so lethal, they should end the movie early with extreme prejudice. Indeed, if there’s any real flaw in the narrative, it’s the rise-from-the-dead aspect of Dixon-the-psycho. He makes Jason Voorhees look like an easy kill. But if it did end early, there wouldn’t be time for the plot’s threads to entwine – an uneasy mom (Kathleen Munroe) who is worried about leaving the son behind with her dad, but won’t say why, a local cop (Krista Bridges) who grudgingly accepts a plea from the absentee parents to check things out, and some seriously messed-up family secrets. What distinguishes Knuckleball from other thrillers involving children is the seeming reality of the peril portrayed. Henry endures some punishment in the course of saving his own life. And in a film world where violence against children is still kind of a line, it makes the movie an occasionally queasy watch. Full marks to Villacis for convincingly conveying controlled panic throughout. Knuckleball. Directed by Michael Peterson. Starring Luca Villacis, Michael Ironside and Munro Chambers. Opens Friday, Oct. 12 at the Carlton Cinema.